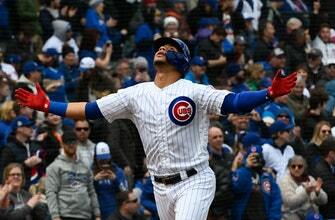 CHICAGO (AP) — Willson Contreras homered twice on a blustery day at Wrigley Field as Cole Hamels and the Chicago Cubs stopped the Angels’ six-game win streak Friday with a 5-1 victory over short-handed Los Angeles. Cubs: C Victor Caratini was placed on the 10-day injured list after a CT scan confirmed he broke a bone in his left hand during Thursday night’s victory over Pittsburgh. He is scheduled for surgery on Monday and is expected to be sidelined for four to six weeks. C Taylor Davis was recalled from Triple-A Iowa to take his place on the roster. … LHP Mike Montgomery (mild left lat strain) is scheduled for a bullpen session on Saturday. He likely will need at least one minor league rehab appearance before returning to the Cubs. … LHP Xavier Cedeño (wrist inflammation) was slated to pitch in an extended spring training game on Friday. … RHP Tony Barnette (shoulder inflammation) was scheduled to throw live batting practice on Friday.